Xenex is not done yet! Announcing issue 6 to be done by end of year! It has been WAY TO LONG!!! If you follow this site, you may have noticed that the last update was October of 2013. I have put this off long enough. I am pushing myself to have issue 6 of Xenex the Bug Man out by the end of the year. Keep an eye out on this page for upcoming sneak peeks at pages! For the month of April, you can check out my show at Freaks and Geeks LLC in Denton, Texas! I have a whole hallway, and I didn't waste any design space. I am calling the show, "Look at all this SPACE: art by Barnlord". It will feature custom toys, prints and paintings by me. There will be a good range in prices for the items I will have. I'll also be rolling out the elusive Abducto-Eyes table top toys from my last year's instagram feed. This is the first time they have been available to the public. I'll have Wereworms, Cheesecake Head Charlie pins, Pabst Wrestler Beasts, and more! Issue 5 has been added to indyplanet! If you haven't got your copy yet, head over to the site and have a copy printed up for your collection! Just to let you know all know, I am taking commissions for Xenex the Bug Man characters. If you would like to commission me for original artwork, head over to the commissions tab in store to see how. If you want to see more work from me, Taylor Lymbery, the creator of Xenex the Bug Man, then check out my sweet little art site! 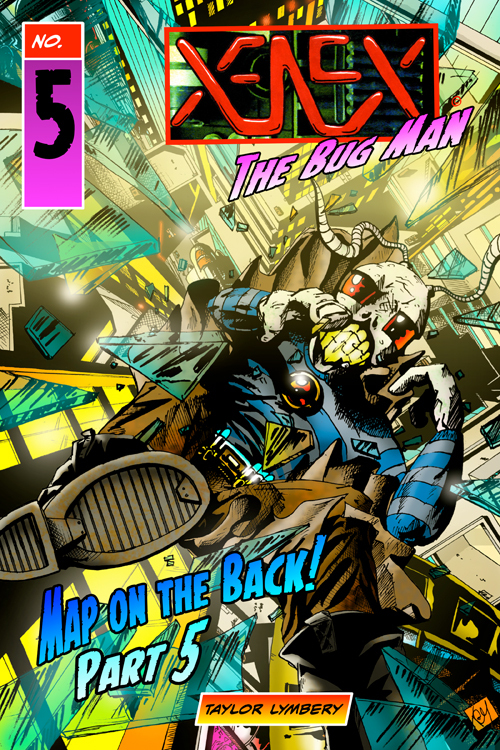 Issue 6 Cover of Xenex the Bug Man Revealed! Just in time to promote Xenex the Bug Man before the Dallas Fan Days Convention, Friday October 4th- Sunday 6th, I have the issue 6 cover to share to you all! This cover features the Magician which means that you could see him in this issue. Is there a Magician fan out there? I did get a table at the Dallas Comic Con: Fan Days in October. If you are in the area, stop by and check out the convention and stop by my table! Xenex the Bug Man gets his very own custom toy! The Vinyl Thoughts 4 art show is done and Taylor finally gets to show his prized pieces. One of those pieces just so happened to be made as Xenex the Bug Man! If you want to see more pictures of this piece head on over to Taylor's Sweet Little Nerd site to see more! Xenex the Bug Man in rare form... Rare custom toy form. 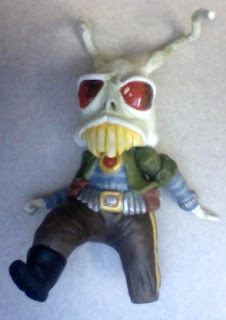 It has been a while since I have produced a custom toy to post on my art site. I started making this guy back a few months ago, but had to stop due to lack of time. Now that my schedule has been freed up a bit, I think I would like to get this custom finished. Since this is a custom of my favorite comic book character, Xenex the Bug Man, I figured it was time to post a picture of it here. The base for this toy so far is nothing short of amazing, but I decided not to post a picture of it yet and keep it a bit of a surprise. I think that this custom will be pretty stellar once it is finished. I should have it at the next convention to see. We'll have to wait and see. Issue 5 is now available on indyplanet.com! 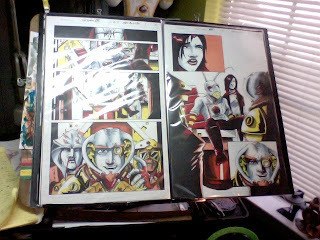 I had issue 5 of Xenex the Bug Man at the recent Dallas Comic Con for sale. I completely sold out at the convention. So, if you didn't get your copy don't fret, issue 5 has been uploaded to indyplanet.com for purchase! It's good so go, get your issues now! I posted some post Dallas Comic Con goodness and pictures on my Sweet Little Art site. You can see the posting here. I know that it is still months away, but just to let you know way ahead of time, I got a table for the Dallas Comic Con: Fan Days Convention in October. If you were unable to make it to this last Dallas Comic Con, this next big show would be good to go to. 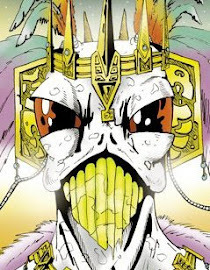 If you want to see more work from the creator of Xenex the Bug Man, Taylor Lymbery, then check out his site! Good news! 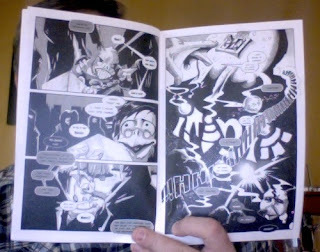 I have issue 5 in my hand ready to sell at this upcoming Dallas Comic Con! If you don't have any of the issues, don't fret, I have more printed issues of the full run so far. There are some nice page spreads in this book. I did find a misspelling. When I found it I couldn't stop laughing! I'll wait to see if you all can find it. When I bind all of the issues together to print as a graphic novel, I will have many mistakes to fix from all of the issues. As far as the next issue, I'm not entirely sure when the next issue will be out, but when I do get to work on it, I'll post the news here for you all to see. Marvindog Media. If you are going, stop by and say "hi". A quick issue 5 update and a shout out! I'm getting close to the end of this spectacular issue! My hope is to have this issue ready and printed by the Dallas Comic Con in May of this year. We'll see. I'm working through a couple of comics now trying to get scheduling to work. Now I need to give an awesome shout out to Reese, a Xenex the Bug Man fan and fantastic convention cosplayer, and Taffeta Darling, a fantastic podcaster and convention cosplayer! They were recently on the DELoL show this last Sunday. Here's the video. Reese was there talking about her last experience with the Sci-fi Expo, the Super 6 charity organization that she is a part of and her science project. It's a great show! Check it out and share with your friends! At the end, Reese shows off some art work that I made for her and Taffeta, from the Curves and Comics with Taffeta Darling blog, Mentions the Bug Man. You guys rule! Thank you for the shout outs! 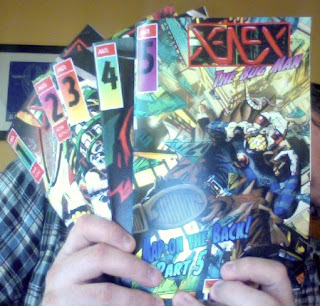 I did have several requests for Xenex the Bug Man issue 1 at the convention. I should have issue 5 ready for the next con, so I will put in an order for issue 1 to have a few there at the convention. If you don't want to wait for it till May, you can go ahead and get them printed from the indyplanet site! Go to my comic store tab to see the listings of comics that I have available. I did purchase a table for the Dallas Comic Con that will be on May 17th-19th. I hope to see everyone there!